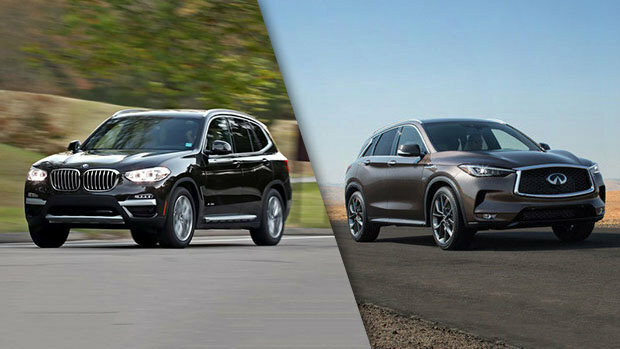 Here are 2 mid-size luxury SUVs, the 2018 BMW X3 and the 2019 Infiniti QX50, to discover and test drive at your Spinelli Infiniti dealership, located in Pointe-Claire. No matter the region where you live, whether it be Montreal, Laval, the West Island or Montreal-East, the mid-size SUV segment includes so many players that it is now tough to make the right choice. Except, of course, when a manufacturer harmoniously combines all the characteristics that make them one of the most talented players of the team. This is exactly what differentiates the 2019 Infiniti QX50 crossover from the rest of the pack. It stands out, among others, with its new 2.0-litre VC-Turbo (Variable Compression Turbo) 4-cylinder engine of 268 horsepower. This is the first engine of its kind available to the public. In an instant, its compression ratio can go from 8:1 (low) to 14:1 (high), which allows you to maximize efficiency by producing maximum torque while reducing consumption. Taller and larger than its previous iteration, the interior space is thus logically improved. Once the rear seats are folded down, we get a cargo capacity of 1,822 litres. The 2018 BMW X3, for its part, provides a little less with 1,600 litres. The interior of the 2019 QX50 screams luxury with a capital L, in particular with hand-tailored stitched leather, textured aluminum and natural maple open pore wood trim. Slipping inside this space is a fantastic sensory experience, and as soon as you will step on the accelerator, you will never want to leave. Want to bet on it? Cutting-edge technology is an integral part of this superb Infiniti SUV’s features as well. With the Infiniti ProPILOT Assist, you will have access to a whole suite of innovations specifically designed to complement your natural driving abilities. Innovations such as the Head-Up Display that projects important details onto your lower windshield such as speed, turn-by-turn navigation and warnings closer to your field of view. So, for all these reasons, it is easy to see why the 2019 QX50 constitutes a better alternative to the 2018 X3. To find out more about its qualities, numerous we should point out, visit your Infiniti dealership today in Montreal, close to the West Island, Montreal-East and Laval, and find out about the Infiniti financing options within your reach.